Kaisai no genriis a set of rules of thumb which were used by the goju-ryu karate master Chōjun Miyagi to decode the Goju-ryu katas and find the original meanings within. 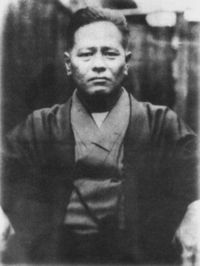 Student of his Seikichi Toguchi brought this information to western attention in 2001 in his book Okinawan Goju-Ryu II: Advanced Techniques of Shorei-Kan Karate. It's likely the same rules can be applied to other non Goju katas also. It is also likely that at least some of the rules apply also to White Crane kung-fu as Goju is heavily influenced by White Crane and karate generally is heavily influenced by kung-fu forms. The theory behind Kaisai no genri is that Chinese forms began as simple paired drill sets with attacker and defenders. They would have been practising responses to common types of attack. As the numbers of different drill sets increased they became increasingly difficult to remember, so the defensive halves were concatenated into continuous sequences of movements: kung-fu forms. These then made their way eventually to Okinawa where they became katas. This means that Chinese kung-fu forms, and karate katas are likely made up of sequences of drills. That katas can be broken down into many short sequences of movements which made up the original drills. These would be the primary applications of the movements in the katas. That the sequences are concatenated together one after another. When one ends, the next begins. An additional implication is that the drills recorded would take the practitioner from a position of weakness to having defeated the opponent within just a few movements. That being the main purpose of these types of drill. The types of attack which these movements would be designed to defeat would be common "street" type attacks not competition karate/kung-fu punches and kicks. i.e. close range grabs and grapples. Position of weakness -> Movement A -> Movement B -> Movement C -> opponent defeated. There doesn't have to be three movements within a sequence, it can be more or less, but three appears to be common. 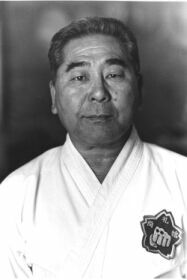 The implication of the theory of Kaisai then is that kata have a very definite structure. The rules which Miyagi used to decode the katas he knew are made up of three main principles, and many additional guiding principles. Don’t be deceived by the Embusen Rule. The kata embusen is there to allow practise in a small area. It has no bearing on the applications within the kata. Techniques executed while advancing imply attacking techniques. Those executed while retreating imply defensive or blocking techniques. There is only one enemy and he is (usually) in front of you. Turning to face a new direction does not mean you are turning to face another opponent. Every movement in every kata has martial significance and can be used in a real fight. Katas have been changed and edited many times throughout history this means that all of the movements have been retained for a reason. A closed hand returning to chamber usually has something in it. There is no block. "Blocks" are usually components of other techniques rather than "blocks". Pay attention to the angles. The angle you turn to represents the angle to take with respect to the opponent. It does not represent turning to face a new opponent.